I’m taking a break from blogging for the next few weeks, possibly more, while I catch up with family and friends in India. Since this is going to be my last post for a while, I wanted to sign off on a sweet note. This is something I made a really long time back. It was inspired by a recipe I came across on the Hershey’s website. Preheat the oven to 350 degrees F. Line the muffin pans with paper liners. 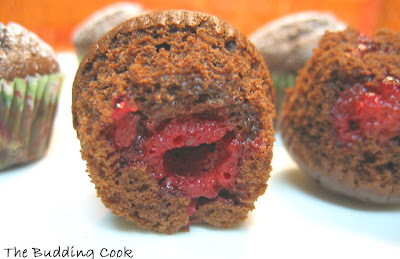 Place 2-3 raspberries at the bottom of each muffin cup. In a large bowl, mix together the dry ingredients. In a separate bowl, mix together the wet ingredients. Add the wet ingredients to the dry ingredients and mix well till the whole batter comes together. (Too much mixing will result in brownies that are too dense/heavy.) Gently fold in the remaining raspberries. Fill muffin cups 2/3 full with batter. Bake for 18-20 minutes (check after 15 minutes) or until a wooden toothpick inserted in the center comes out clean. Remove from muffin pan, cool slightly, top with a dusting of powdered sugar and serve. That's it for now. See you when I resume blogging! 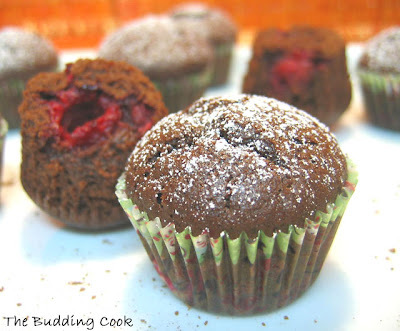 What a chocolatey treat to keep us satisfied till you get back... raspberries and chocolate are made for each other..
yum, those muffins look so good. Love the last picture. Enjoy your break. ooye gooye raspberry cups....they look yummy. nice and moist. iam craving for one right now!!!!! those look lovely :) enjoy ur vac!! You temptress! I want these right now. I will miss you while you are away from your blog. Enjoy your time with your friends and family. Have a great time in India..The muffins look lovely n chocolatey! the raspberry center surprise looks amazing! lovely raspberry kiss!! enjoy ur break! What a nice treat, with which to leave us. Have a good time off! Burp! burp:) They were so good! Hey no news from you for long? I love raspberries and anything made out of them...great muffins. Have a great time in India TBC! They are looking so good tbc!! why don't you send them to my event called Sunday Snacks that I am hosting with the theme being Bake it. Do check for further details my blog. umm my hunger pangs more..yummy looking brownie..
How gorgeous are those! Hope you're enjoying yourself in India, TBC. always love a surprise in the center :), specially if its in a chocolate muffin ! Great looking brownie cups! Yum! Yum! Everything looks delicious! I want to eat one of those brownie cups right now! And I so have to try those Chickpea Tikkis, I love chickpeas! Mint flavored chocolate ... yummmmmmmy! And those photos are absolutely delicious! Oh! you have left for India! I was wondering what happened to TBC. the brownie cups look very moist and tempting.